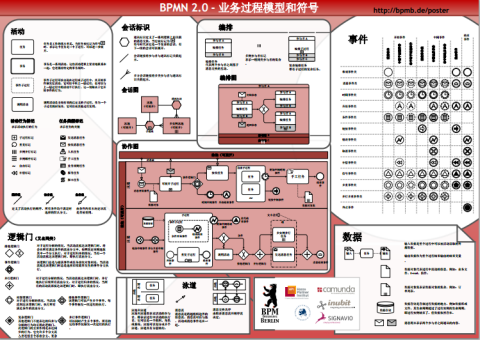 Finally, one of my wishes for BPMN presentations has come true: The BPMN 2.0 Poster in Chinese is available! Every time I liked to highlight the complexity of BPMN 2.0 in a presentation I wished I could simply show a Chinese version of the famous poster. Anyway, thanks to our colleagues from the School of Software Engineering in Beijing Jiaotong, we now have a Chinese version along with a written discussion of the Chinese BPMN terms available right on the Poster's Website: http://bpmb.de/poster. The well discussed translation will hopefully pave the way for a broad introduction of BPMN in China. While you're on the link, please also take a closer look at all the other interesting languages that we offer, currently counting at 13: English, German, French, Spanish, Russian, Swedish, Italian, Dutch, Portuguese, Polish, Hebrew, Ukrainian, and Chinese (in order of their creation)! Visually interesting is the Hebrew version, with text running from right to left. One more thing: Finally, take a closer look at the footer: The page has been viewed more than 180.000 times! Last friday I attended our regular BPMB (Berlin BPM initiative) meeting, discussing the topic of BPM Governance. While the presentations (from Siemens and comdirect Bank) have been as fine as expected and a lot of discussion took place (as usual), I figured out one remarkable fact: Almost half of the 14 attendees came from outside Berlin! By outside, I really mean a bit of a ride away. We had two people attending from south-east (Dresden), one from Erlangen, and three from the north (nearby Hamburg, Quickborn, Bremen). This is especially interesting, as the BPMB is a free (e.g. no money involved) initiative from/for people interested in BPM, including vendors, customers, consultants, researchers and anyone else who has a stake in BPM. From my point of view, this is a really stark sign of visibility for our BPM roundtable, also in the European view. If you would like to join us in one of our workshops, just visit the BPMB homepage or register for the Newsletter at the BPM-Netzwerk. Hi out there! I'm back with my blog, after having fixed some PHP5 related issues (my provider forced me to upgrade). Nevertheless, I brought a very exiting must-read for you (as long as you understand at least a bit German): A student of mine, Christian Thiemich, wrote a wonderful Thesis about an agile BPM methodology. While you might should know what BPM means, a methodology might be alien to you. Basically, a methodology brings together a development framework (such as Waterfall or Scrum), tools and techniques (such as Quick Checks), and artifacts (e.g. process models). The framework guides you in when to use which tools and techniques to create which artifacts. The presented framework relies upon the proven Scrum software development framework as well the Integrated BPM project methodology. The former provides the ingredients for a state-of-the-art agile development framework, whereas the latter provides a toolbox for executing the earlier phases of BPM development projects (focused on business and service modeling). By bringing together those two state-of-the-art frameworks, Christian opens the door for real customer-centric BPM projects - the Customers get the processes they really need, not the ones they designed upfront. If I teased you enough, get the full story here. During the last year, we at inubit Labs investigated the possibilities to automatically create process models from natural language input, i.e. plain text. Just imagine the possibilities by combining this technology with voice recognition: While you interview a process participant (or even better: a c-level executive), a process model is automatically created during the interview. Combined with innovative process merge capabilities, you can even do workshops with many participants - and nobody has to do the drawing. Instead the systems shows you conflicts and missing information in real time. Another use case is the automatic investigation of existing texts, such as work instructions. Imagine a consultant walking into a new company and feeding the system with all the information available. He then gets a quick overview of duplicates, conflicts and missing information in a structured and formal way (e.g. process and other models). Even more, this information is stored in a "world model", that could be the foundation for a comparison with as-is processes captured via the methods discussed before. Actually, it's quite a bit to go for the vision, but the core technology is yet available. What is still a manual task, is the post-processing of the created diagrams. If you're interested in the topic, I recommend taking a look at our CAiSE'11 paper as well as the excellent Masters Thesis from Fabian Friedrich. And while we don't have a prototype online right now, our competition already has: http://www.ravencloud.com/. Nevertheless, they require far more structured input than the approach we investigated, so that I doubt they will be able to handle the scenarios introduced above.